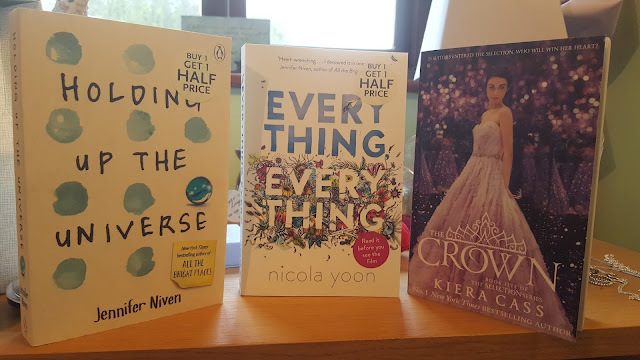 As it was my birthday the other week I decided to have a small book haul! Its been a while since I have bought new fiction, the majority of the time now I just borrow books to read from my workplace. However they don't always have all the titles that I want. Therefore it was time for a haul of sorts! 'Everyone thinks they know Libby Strout, the girl once dubbed 'America's Fattest Teen'. But no one's taken the time to look past her weight to get to see who she really is. Since her mum's death, she's been picking up the pieces in the privacy of her home, dealing with her heartbroken father and her own grief. Now, Libby's ready: for high school, for new friends, for love, and for EVERY POSSIBILITY LIFE HAS TO OFFER. I know the part I want to play here at MVB High. I want to be the girl who can do anything. While the plotline seems similar to All the Bright Places e.g. two teens paths cross and their lives change forever. I'm willing to give this book a go and see what I think as I enjoyed Jennifer Niven's writing style so much the first time round. I have heard so many people raving about how good this book is so I knew I had to pick it up for myself and see what all the fuss was about. I think this out of all three is the book I am most excited to read as it is a different take on your typical boy meets girl story. I was obsessed with the Selection Series I enjoyed these stories so much even when the focus shifted in the Heir to America's daughter Eadlyn. I've heard some not so good reviews on this book but as the Crown is the final book in the series I feel I need to read it and see what I think of the ending for myself. I'm hoping that the reviews I've read are just overly critical and that overall I will enjoy this book. So there you have it those are the books on my to be read list for April 2017, as you can see I'm a big fan of YA fiction. What books are on your to be read lists? Have you read any of these titles before? If so what did you think?